High-quality bristles in an innovative wave design give your pearlies a thorough and complete cleaning! 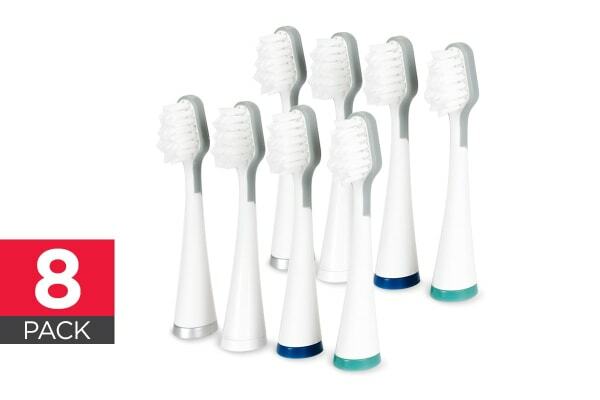 Get a gentle yet effective clean quickly with the 8 Pack Replacement Toothbrush Heads for Kogan Soniclean Pro Toothbrush. The superior-quality DuPont bristles on these brushes are arranged in an innovative wave design that allows them to reach every part of your tooth for a thorough cleaning. The curved neck of the brush head fits naturally around your teeth as you brush making it easy to achieve complete cleaning. It is recommended that you change your brush heads every 3 months, or sooner if the bristles exhibit fatigue. For use with the Kogan Soniclean Pro Toothbrush and Kogan Soniclean Pro Toothbrush with UV Sanitiser.